Airports can be one of the most frustrating places in the world to spend an afternoon. Getting to the airport two hours early, waiting in security lines, taking off your shoes, walking through space-age like metal detectors, it can all be a huge hassle. But it wasn’t always that way. Before the days of 3.4-ounce liquids and random screenings, airport security was pretty simple. While the events of Sept. 11, 2001 facilitated heightened security measures, the catalyst behind the beginning of airport security occurred 46 years prior. The date was Nov. 1, 1955. The flight was United Airlines Flight 629 from Denver to Portland, Ore. Just minutes after takeoff the plane exploded over a beet farm in Longmont, Colo. All 44 people onboard died. Federal investigators determined the explosion was the result of a dynamite bomb in a checked bag. A passenger’s son, Jack Graham, confessed to placing the sack of dynamite in his mother’s suitcase. He was looking to cash in on his mother’s life insurance. The explosion of Flight 629 was the first major act of criminal violence on a United States airline and the years following the tragic flight ushered in the beginning of the Federal Aviation Administration’s modern security measures. The first security measure, beginning in 1961, was the simple addition of armed guards on planes, but only when requested by the FBI or by airlines. The FAA more aggressively began security requirements in the late ’60s and early ’70s after more than 130 successful and attempted airplane hijackings. First came the FAA’s hijacker psychological profile used by ticket agents to determine if passengers were a threat to the skies. 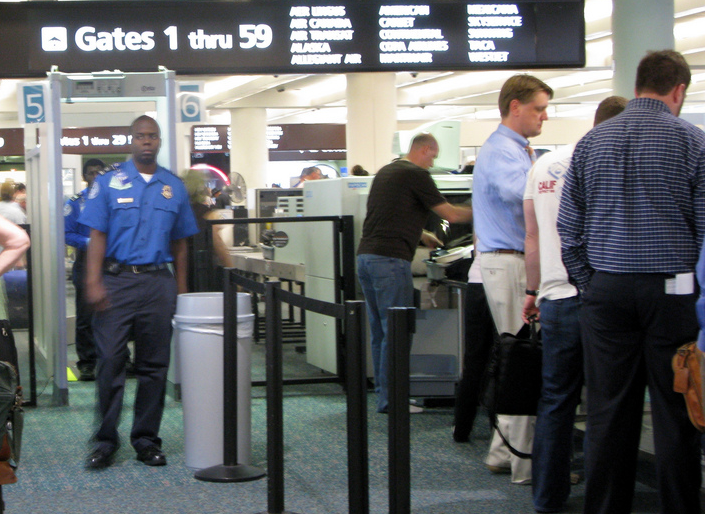 Flyers who exhibited odd behavior, such as lack of eye contact or inadequate concern for their luggage might be subjected to additional scanning. Next came the creation of the Customs Air Security Officers Program, also known as sky marshals, followed by the Explosive Detection Canine Team Program. Even with increased security, airplanes were still under constant threat. The lack of manpower resulted in additional hijackings, including one of the most captivating unsolved incidents — that of D.B. Cooper. A man claimed to have a bomb, hijacked a flight and ransomed passengers. The passengers were released and the man parachuted from the plane, never to be found. Two years later, in 1973, the FAA began requiring all commercial airlines to use X-ray machines, metal detectors, and personal searches to screen passengers and carry-on baggage for weapons and explosive devices. Over the next four years, the FAA reported only one successful hijacking since the beginning of standardized security measures were implemented. The security measures following the 70s were by far and wide more reliable than those in the 1950s and ’60s, but it still wasn’t enough. Passengers were allowed to arrive just 30 minutes before boarding, families and friends were allowed at gates and security was often outsourced to underpaid contractors. Following the events of 2001 – the Sept. 11 attacks and the infamous attempted shoe bombing in December – the Transportation Security Administration was created. Today we have boarding pass inspection, strict checkpoints and constant reminders never to leave your bag unattended. Is airport security moving backwards now? Not quite but some standards are being relaxed. In 2008, the TSA began using state-of-the art Advanced Imaging Technology at airports. The scanners took detailed photos of passengers to detect metal and metallic objects. However, after much controversy the units were removed in June 2013. In recent years, the TSA began implementing the PreCheck program for qualified frequent fliers. The program allows for quicker transit through airport security, while the passengers can leave on their shoes, belts and light outerwear. Some airports are even using layers of security to allow for expedited screening – as one Consumerist editor recently experienced. Just as airport security evolved following the 1955 explosion of Flight 629, it continues to evolve today.